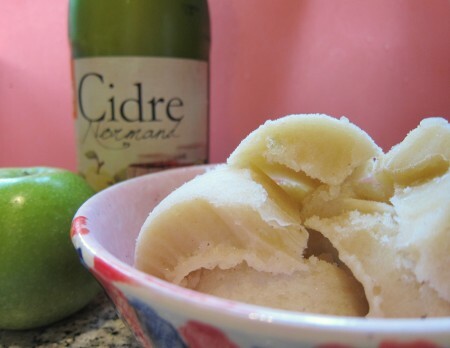 Cider from Normandy and delicious green apples baked together form the basis of this rustic sorbet. 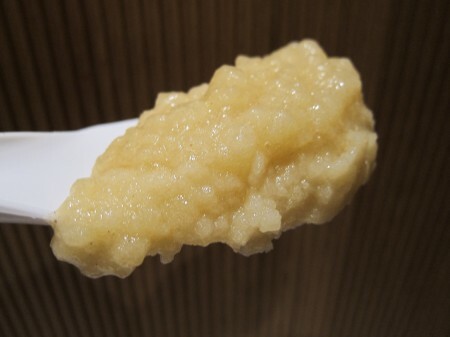 My first taste brought about vivid and positive childhood memories of mother’s home-made, deliciously cooked apple-sauce. The cider brings an additional dimension to the final flavour experience. This baked apple sorbet is basically an adaptation from a recipe by Jeni Britton Bauer (Jeni’s Splendid Ice Creams). But what about the cider? Yes, it is cider of the alcoholic type. As you may know, Normandy in France is particularly famous for this type of fermented apple juice. 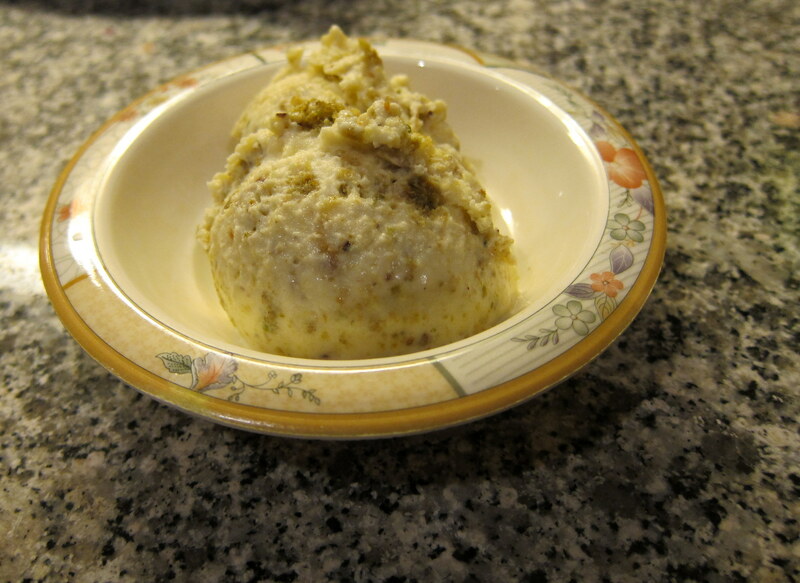 I used a sweet cider (2 % alcohol), which seemed like a good idea for a sorbet like this. But thanks to evaporation, you will be able to serve this sorbet also to children and others who refrain from alcohol. 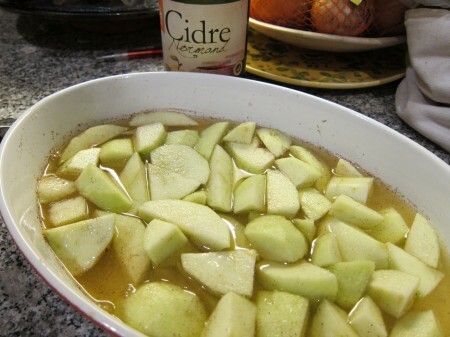 Since the cider follows the apples into the oven, the small initial amount of alcohol will soon be long gone. If the alcohol evaporates anyway, can’t you just as well skip the cider altogether? Well, I guess you could but even if the alcohol evaporates, the particular cider-character still lingers. You may not think that a touch of fermented apple juice would make any difference, but it actually does add to, and deepens, the total complexity of the sorbet’s flavour. As you can see, the recipe also calls for inverted sugar. Jeni used corn syrup, I decided to go with Agave nectar (Agave syrup, if you like). While inverted sugar could be excluded, you would then have to increase the “normal” sugar amount to make up for the loss. Besides, the inverted sugar here is mainly used to ensure that the final frozen sorbet has a nice, scoop-able consistency. Talking about consistency and texture – avoid over-churning the sorbet: just let the base spin in your ice cream machine for about 10 minutes or so, until the consistency is similar to that of very softly whipped cream (or soft apple-sauce, for that matter). Appealing, sweet and rustic flavour than combines the charm of home-baked apples with the cider's discreet, yet deepening character. Preheat the oven to 175 degrees Celsius (347º F). Combine all ingredients in a baking dish. Cover the dish with foil and bake for about 30-45 minutes, or until the apples are tender. Purée the mixture in a food processor or with a hand mixer until completely smooth. Pour the sorbet base into the ice cream machine but churn only until the consistency of the sorbet resembles that of very softly whipped cream. Pour the sorbet into an airtight storage container, press a sheet of parchment or plastic wrap directly against the surface, seal and freeze until firm. We found this recipe whilst experimenting with apple gelato. We have a cider apple orchard here in Brittany, France. Apple gelato is very tricky! We found that adding 25de glucose and inverted sugar did help, as did carob seed flour. For a first attempt it does come out slightly too sweet, as it went into the batch freezer we were at 38 Brix! Perhaps due to the increased amount of sweet cider. Nevertheless it tastes very very good. Thanks for the recipe! It would be interesting to match this with a simple creme gelato to get an almost ‘apple pie’ like taste. Ps. We added 285g of sweet cider and no water. Agreed, it was far too sweet! Today I picked some Guillevic cider apples from our orchard and have changed the recipe. The apples are 12 bx and the cider 9 Bx. Adding a little water and some lime juice brought the bx level down to 31. I will churn the mixture tomorrow morning and let you know.